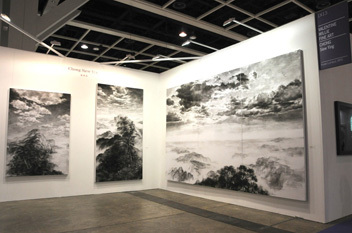 Venue: ART HK12 . ASIA ONE , Booth 1x13. Following on from her solo Infinity at Valentine Willie Fine Art Singapore, Siew Ying shares with audiences in Hong Kong, her continuing interrogation of landscape, memory, space and place. Informed by both traditional Chinese ink painting and European sensibilities she creates imagined charcoal mindscapes that play with texture and formal composition to communicate the infinite qualities of landscape. These sites of meditation, inspiration and drama present a stage for philosophical consideration of Man’s place and purpose in the world.